Despite the fact I was 15 when D.A.R.Y.L. was released, and was a keen cinema goer at that time, I seem to have completely missed seeing this movie. And even though I was aware of it and its basic premise, I have still managed to have unintentionally avoided it over the years... until now. The biggest issue with the movie, other than the fact that the plot is paper thin, is that a big part of the experience is robbed from the viewer if they already know who/what Daryl is. Even the movie's title pretty much gives it away. 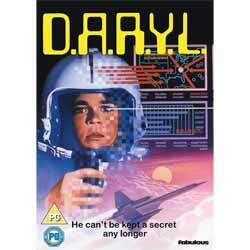 The film opens with Daryl in a car, which is being pursued by a helicopter. The driver, obviously having Daryl's best interests at heart, lets the boy out of the vehicle, so that he can hide in the woods, and then drives over a cliff, so that whoever was after them believes they are both dead. Daryl is then found by an old couple who take him to the local adoption agency. Daryl is then placed with a foster family who accept him as their own, but are surprised when he seems to be a genius at everything. It's only when his "real" parents are found that we discover why Daryl is the way he is. This builds well, so that when the bombshell is dropped, the audience should go through the same sort of feelings that his foster parents do onscreen. But even when you know this twist, at the movie's heart is the interaction of the characters. That's what makes this an enjoyable film. Central to this is the friendship of Daryl (Barret Oliver) and Tyler "Turtle" Fox (Danny Corkill). Their friendship reminded me of the relationship that would occur a few years later between Josh Baskin and Billy Kopecki in Big (1988), in that Turtle is more grown up and streetwise and helps Daryl to act more maturely, and they live across the street from each other, communicating at night via walkie talkies. Oliver was already well known to cinema goers of the time, having appeared in both The NeverEnding Story (1984) and Cocoon (1985), which was released in the same year as D.A.R.Y.L. There have been several versions of this DVD released over the years, all still readily available to buy online, so the question is why should you buy this one? I'm not sure that anything's been done to the print, although as a Blu-ray has also been issued at the same time, I'm guessing that this DVD has a better print quality than previous DVD releases. If you haven't seen this before, it's worth watching and is certainly a movie that the whole family can enjoy. It has aged quite a bit but is still an entertaining affair.